The mural at 21 Isaac St., in early October. Owner Jason Milligan had it covered by Tyvek after being cited by Planning and Zoning, but said Monday that the Tyvek has been removed and the business names painted over. 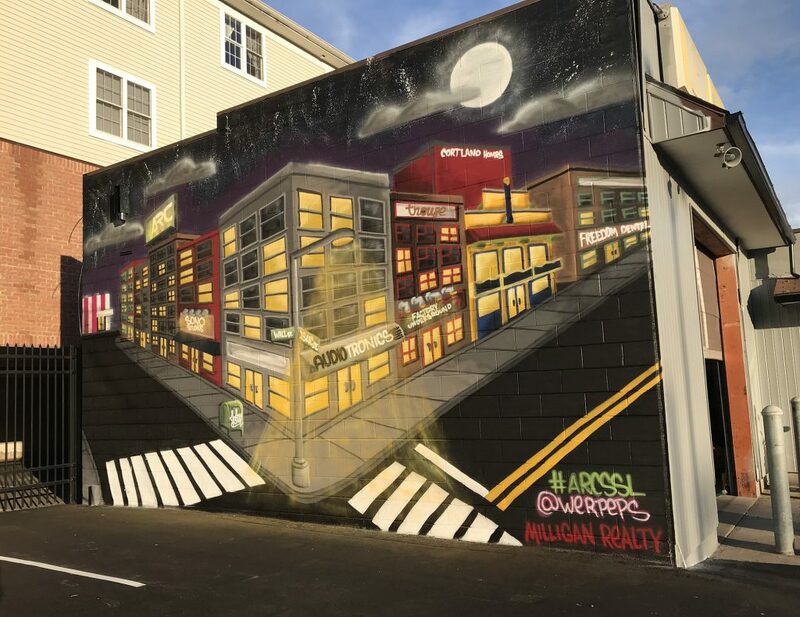 NORWALK, Conn. – Jason Milligan’s Wall Street-area murals are once again visible to the public, he said Monday. Milligan had the Tyvek removed from his Isaac Street mural and the business names painted over, he said. The Mill Hill mural at 97 Wall St. and the seemingly-political mural on the Isaac Street dead end have also been uncovered. The murals were uncovered after Milligan received clearance from Planning and Zoning Director Steven Kleppin, in a series of emails provided to NancyOnNorwalk by Milligan. This controversy dates back to early October, when Milligan had a mural painted at 21 Isaac St. and former Zoning Commission Chairwoman Jackie Lightfield filed a complaint on it, pointing out that the Zoning regulations prohibit business names within murals as they are classified as signage. A second mural was being painted on the side of 97 Wall St. when Milligan received the citation on the Isaac St, mural. 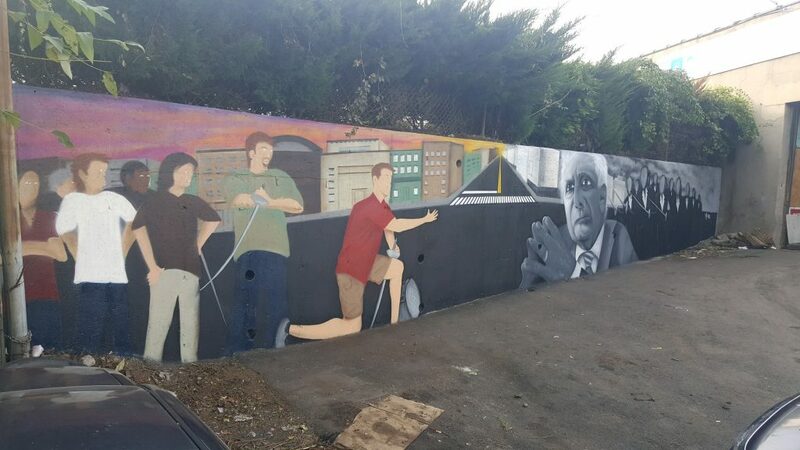 The Isaac Street dead end mural, which includes a figure that strongly resembles Mayor Harry Rilling, went up a few days later. Milligan said he commissioned all three murals at once. The Wall Street mural has been holding up one of Milligan’s tenants, as “Mr. Mango” would be prohibited from getting his final clearance to open at 91 Wall St., until that Zoning violation is cured. Mr. Mango can proceed, Kleppin wrote to Milligan, pending a date on when the business advertising will be removed from the mural at 21 Isaac. 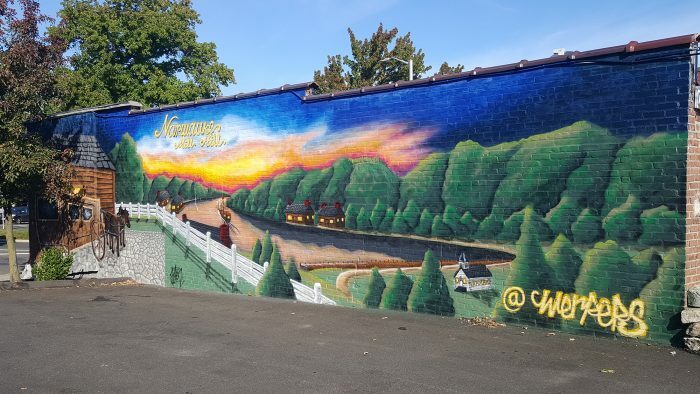 The controversy spread when Milligan filed complaints on other murals, at O’Neill’s pub, Valencia restaurant and the Post Road Diner. The Arts Commission got involved, and the Connecticut Conference of Municipalities (CMM) was being consulted, Kleppin said last week. A petition asking to “Save the Public Wall Art on Wall Street” had 890 signatures on it early Tuesday. And common sense prevails…. still no word on Jackie’s motivation? That such time and energies were required to secure the desired result from City Hall speaks volumes. An uncommon “minor victory” for the people ! And in a City election year. Hurraaah! Progress! Art is good. It is beautiful AND it brings people together. Good for Mr. Mango and all of you Wall Street folks! Now, if only Mayor Rilling et al can indulge in a little humble pie 😉 this Thanksgiving and acknowledge what the Wall Street business owners/residents and a good number of Norwalkers believe, which is that the mural depiction of “what could be” at that POKO I location is spot on, perfectly scaled to the locale, packs in more businesses (businesses which generate $$$) than a massive fortress footprint ever could, and would, if conceived, further catalyze that area as an Innovation District. No fancy 15 million dollar taxpayer money necessary. Tear down phase 1 and bring in a viable downtown where people can walk store to store with restaurants, theaters, ect, the last thing Norwalk needs is more apartments! I the Norwalk home owning taxpayer can’t afford anymore taxes so you need to spend my money a lot smarter than you currently do. Time to look out for the taxpayers of Norwalk, we pay the bills and get very little for it. Let the developers start to pay their share, let’s stop giving away the ranch, let’s stop having the highest paid city employees, most who live out of town with the best benefits and pensions. My corporate pension stopped in 2015 and my health benefits went from great to good to bad to nothing is covered until I meet my $1500 deductible. Time to act like a corporation where every dollar counts and someone has to be accountable to the board of directors, in this case the board is the taxpayers. The progress with Mr. Milligan is a step in the right direction, he is a business man with a commercial real estate background which can only help. Norwalk city government has failed for many many years to bring back our downtown. We have not had a downtown since I was a child, I am now 60. I go to the surrounding towns for that down town experience now. Again no more apartment buildings enough already the infrastructure of Norwalk can’t handle what we have, it is going to cost us dearly in the near future for the over building and over crowding that was allowed to happen. Big is not always better and Norwalk is bursting at the seams. Change our zoning laws they don’t work and never did, they allow for stupid to happen. Happy Thanksgiving to all. Right on, Al Bore! Well said! Watch your back everyone , lets not be convinced thanks have been given by anyone. This may be just about legal fees. A sign for the city is backstabbers are around watch your back. This could be just another red herring. Piles of dirt . asbestos removal,rat infested housing, flooding , contractors special treatment, bridge an power line posturing an obvious social media outrage may be catching up to the mayors and the petition and the email address to complain to city hall may be just sinking in. Its not time to bury the hatchet but to go back and sharpen it, we stil have bike lanes and plenty of stuff to complain about. Im still thinking how much money this mural and Wall st has cost, us as well as city as well. Duff gets involved with a new park in Sono, why is he still calling the shots, electing him again didn’t mean he could resurface and help the city out like the automated parking garage and other poorly planned satnd uos for us, he still owns Firetree and mnay other statewide acts of destruction this park wont help heal anything. continue o write in it may just help after all. Wow, looks like Rilling and cast of Fools take it on the chin again by this Milligan guy! bravo-someone with a brain—murals get to live another day. A stabbing of a man across the street from the Norwalk Courthouse today .Maybe now one of the mayors can get back to running the city. Stabbing happened in a stairwell in Riverview Plaza, this isn’t an epidemic but should be at least concerning. The Tyvek Temple houses homeless the fence has been breached in many areas make you wonder why the city hasn’t taken any time to work on things like that. Just the mention of a stabbing will kill foot traffic like city hall cares what happens to who is left trying to make wall st great again. Harry lets see some concern shut the plaza down outlaw silverware on Wall st. So let me get this straight…when citizens wanted a moratorium in place to prevent altering the keystone property in a TOD area prior to spending $125k in advance of making recommendations for zoning changes, we are told it cannot be done. But, we can arbitrarily decided not to enforce an existing violation in anticipation of a zoning change? Does that mean Milligan can have his dentist now too, since the the CBD zoning is to be amended to permit that?